As a Raltron distributor, NAC supplies one of the most comprehensive lines of frequency management devices in the industry. Raltron Electronics Corporation is one of the most recognized and experienced manufacturers of frequency management products in the world. 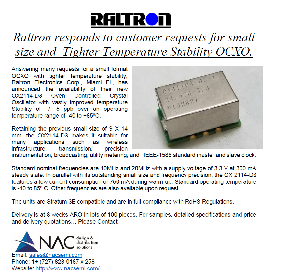 From simple tuning fork crystals to high stability oven controlled crystal oscillators, Raltron has they product needed. 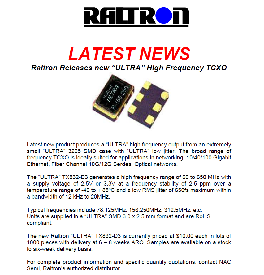 Raltron products feature precise frequency tolerance and stability, wide frequency ranges, smaller packages, low phase noise and jitter, and most importantly, they meet or surpass the customers’ specifications.